I’m a bookworm and always have been, but bizarrely, my parents and sister have never shared my enthusiasm for reading (nor does my husband!). Growing up I always had my nose in a book, and most of my childhood memories are of me reading under my duvet with a torch, probably much further into the night than my Mum was ever aware. I often used to polish off a book, cover to cover, in one sitting. So when I became a Mum myself, one of my big wishes was that my daughter would share my love of books and that she’d grow up wanting to read her way through my vast reading collection. Sure enough, Little I seems to have inherited my bookworm genes. She loves to hide away in my library (ah hem, box room! ), and flick through my books pretending to “read in [her] brain” as she sees me do. I recently moved a lot of her books into my library too so that we can sit in there and read together. A couple of weekends ago, when it was wet and windy outside, Little I asked if we could write a story together. Naturally, I jumped at the chance. I would love to have a book published one day, so getting my daughter started at the tender age of four means that maybe she’ll have a better shot at it than me! A while back I’d read a post on another blog I read regularly, entitled ‘How to get your kids into poetry: Granny is a vintage cheese’. I’d bookmarked it, as at the time Little I was a little bit too young for it, but I knew it would come in handy one day soon. We adapted the exercise as Little I was set on writing a short story, rather than a poem. The idea is that you think of a person together whom your child knows, and then you brainstorm creative words around that person which help to describe them. From this you are left with an armoury of expressive words to use within your poem/story. Sara Bran’s post explains the process in much greater detail if you want to have a read. Little I decided that her chosen person was Cinderella, who she happens to know extremely well apparently! Following our word brainstorm, I guided Little I on how to use the words that we had noted down together to construct a story, but the story is completely her own. I resisted putting any words or ideas into her head. The below story is how she dictated it, verbatim. I particularly like her use of rhyme in the third paragraph! “It was a sunny day and Cinderella sat down on the bench. The ugly sisters were ignoring her. The sky was blue and the stars were shining bright. There were apples on the tree and Cinderella picked one. “Suddenly a scary cat with sharp claws appeared. The cat had come from South America. He’d been scratching all of the carpets there! “Daisies are fluttering in the sky, smelling beautiful. The lane is shining bright and the trees are alight. On finishing the story, Little I decided she wanted to illustrate it too. 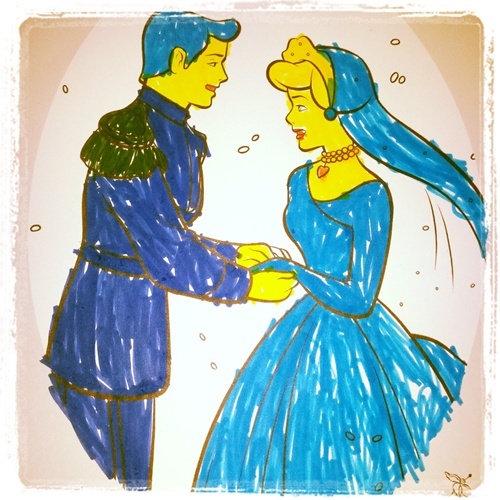 She coloured in a picture of Cinderella with an awful amount of care and attention to detail. I’m proud of Little I’s first story and so was she. If you give this exercise a go with your little one, I would love to see your child’s results below!